Da Lat, a small city 240 km north of Ho Chi Minh, at an altitude of 1500 m. As you can imagine, the temperature is much colder than HCM, so much so we had to wear coats and scarves at night! Da Lat was definitely quieter and cleaner than the big city, although there was a definite absence of bars serving cold beer, without ice in it. At least in HCM, we know a couple of places where we can rely on that! We took a 4 day tour with Chung, my brother-in-law, and Van, his wife. There was 12 of us on the tour, all Vietnamese　(except me, of course), which was quite a change from the other tours we took to the Mekong River and to Cu Chi, since all the other tourists were exclusively foreigners. On the 28th, on our way here, we stopped to see the Pongour waterfalls. It was no Niagara, but the view was still beautiful, and we acted like real tourists, taking cheesy pictures at will. On the 29th we had a pretty busy day, which felt more like a marathon. First, we visited the Da Lat Botanical Garden, and a place where they sell all kinds of dried fruits, fruit juice, tea, and Chinese medicine. I even got to see dried tiger’s reproductive organs, used to make some sort of wine with properties akin to Viagra. Then, we went to see mount Mong Mo (”Dream” in Vietnamese), where we visited some sort of a theme park definitely too touristy for me. We saw an old house built with no nails at all (that was interesting), and inside it, a round table that supposedly turns by itself either clockwise or counter clockwise, depending on which direction the people resting their hands on it are concentrating. The weird thing is that it “worked” in both English and Vietnamese, but not in French, presumably because the woman in charge of the attraction didn’t know whether I was saying “left” or ”right”! The garden was really beautiful, but the scale model of a part of the Great Wall of China (!?) was not too convincing. I skipped the weird animal exhibition all together, and took a nap instead! After lunch, we went to see the “Domaine De Marie” church, one of the residences of King Bao Dai, and the Thien Vuong Co Sat Pagoda, which was built by the Chinese. On the third day, not really excited by the prospect of visiting two lakes in the morning, we went to see the K’Ho people, which I will devote a whole post to, and then we went to visit the Linh Quang temple, where we were cordially invited to taste their vegetarian food. In the afternoon, we joined the group again and went to see another waterfall, and the Truc Lam temple. In the evening, we went to visit the Da Lat market. On the last day, we left early in the morning and stopped at the Datanla waterfall, and stopped in the afternoon to taste locally produced coffee and tea in the Bao Loc province. It was a pretty good tour to take pictures (about a thousand between me and Man!!! ), but I wish it had been more instructive. Anyway, we had a real great time! I’ll make photo albums about the most interesting places later, but for now, enjoy these few pix! The Great Wall of Da Lat! On December 26th we also visited the Cu Chi Tunnels, at about 40 km north-west of Ho Chi Minh. Before and during the Vietnam War, the Cu Chi guerillas, supporting the communists, dug an impressive network of tunnels in which they were hiding from the enemy. We visited different spots explaining how the guerillas were recycling American weapons for there own use, and how they were making booby traps out of virtually nothing. Then, we crawled through a very narrow tunnel about 100m long, which is in fact twice the size of the real thing so foreign tourist can get a feeling of what it was to go through one of the tunnels. It was pitch black, hot as hell, and we had to crouch all the way to the other end. I can’t imagine how these guys could go through these tunnels with their gear on and everything! Check out the awesome pictures we took here. 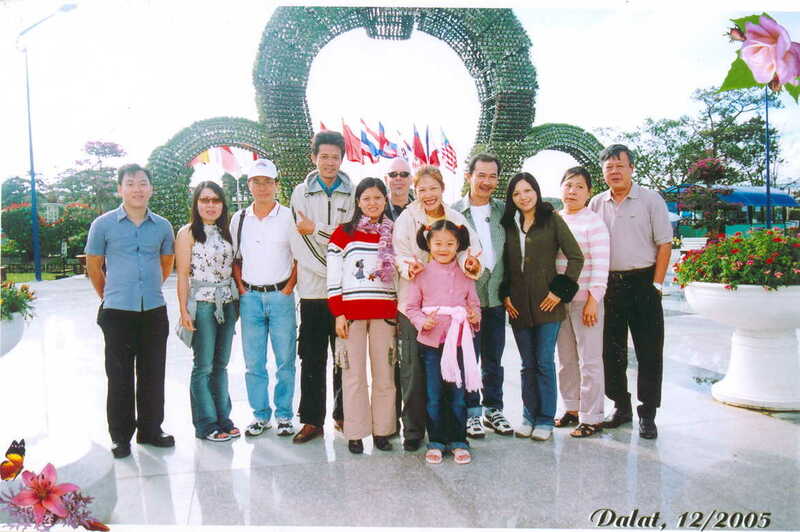 On December 26th we went to visit the Cao Dai Temple in Cu Chi, at about 40 km north-west of Ho Chi Minh. Cao Dai is a relatively new religion, and is a syncretism of Buddhism, Taoism, Confucianism, Christianity, Islam, Hinduism, and Spiritualism. We visited the temple at the former Cao Dai headquarters, and saw one of their ceremonies. It was awesome. Check out the album here. The holiday fever was felt here too, in Ho Chi Minh, although it had a rather local flavor! Is it just me, or does the one on the left vaguely look like a Viet-Cong? Apparently not so unusual here! Ah well, in the end it’s all the same, except for the yellow belt and how hot it must be under that suit! Yesterday we went on a one-day trip to the Mekong River. First, we got there by bus, and then got on a motor boat which took us to visit a fish and fruit market in My Tho. Then we went to Turtle island to have lunch, and after that we moved to another island to visit a coconut candy factory, where I even got the chance to play with a python. The highlight of the day was a canoe ride with Vietnamese rowers. It was great! You can see Man’s pictures here, and my pictures here. There’s also a clip available here, but it’s an MP4 file so you’ll need to install Quick Time, if you don’t already have it. You are currently browsing the ☆MY BLOG☆僕のブログ☆MON BLOG☆ blog archives for December, 2005.